I was thinking a lot about what brand to discuss and decided to stop on Google. Google is the company I admire, mostly because of their clever business style, which allowed them to become the most powerful media company, in spite of the fact that they were not pioneers of the search engine business. So, as for their brand... At first, the name itslef is a good finding for a search engine. "Google" was created from "googol" - the number represented as one followed by 100 zeros. The style of the logo is very simple, but bright. Simpicity is what attracts me when I'm looking on their logo and web-page. Ruth Kedar, the graphic designer who developed the now-famous logo says that instead of having the pattern go in order, the decided to put a secondary color on the L, which brought back the idea that Google doesn’t follow the rules. 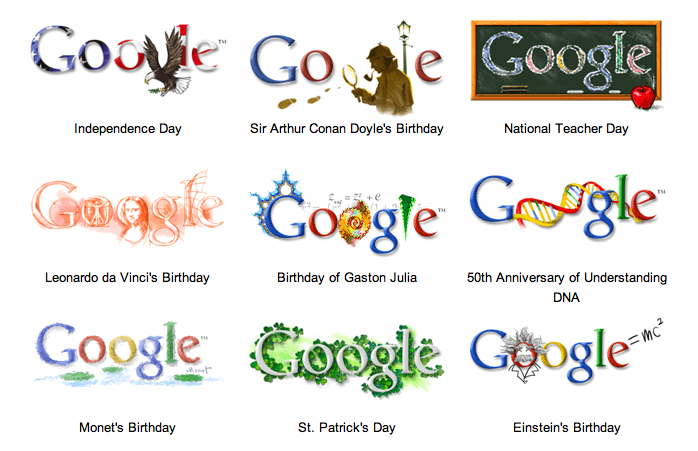 One more attractive thing is the different logo styles Google makes for different occasions (Google Doodles). Different styles, but recognizable logo anyway.